Get Cleaner Than Ever! Scrub Your Body The Easy Way. A powerful scrubber to get all your body parts clean. This hand held scrubbing tool would make the perfect addition to any bathtub or shower because it is ideal for anyone that wants to get really clean without a whole lot of effort. It will wash you better than a washcloth, and it is more gentle on your skin than other scrubbing tools are. The Body and Sole will gently deep clean your skin to leave it looking and feeling great. 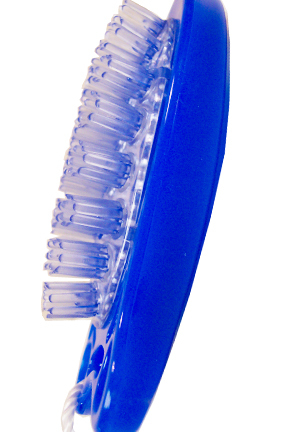 Nearly 200 flexible fingers will work together to build a strong lather and eliminate dirt quickly and efficiently. This product is similar to the Soapy Soles, which is designed to clean feet without having to bend over, but with this one you can easily hold it in your hand, and use it to wash any part of your body. Forget about using a plain old bar of soap, and stop wasting your time with stinky washcloths in the shower. This body washing tool is incredibly hygienic, and it works great. You can even place it in the dishwasher to thoroughly clean and disinfect it any time you feel it is necessary. The Body and Sole will allow you to get yourself super clean without having to resort to harsh exfoliators and scrubbing tools. This little guy will give you all of the ability that those harsher ones do, but it won't bother sensitive skin or cause irritation. The Body and Sole is gentle enough to use everyday and it produces the level of results that will make you want to. It generates as much soapy lather as those ineffective poofs, and holds enough to wash every body part without reapplying. Compare this to any sponge, washcloth, or loofah you are using currently and you will be surprised at the results. 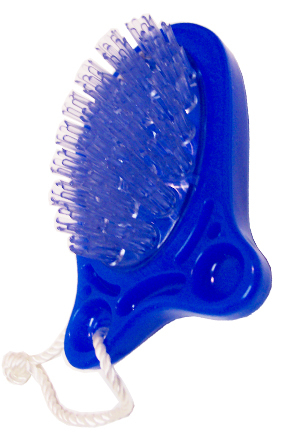 This little bath scrubber will outperform traditional and more expensive bath products. Your body will be cleaner, and it will be easy to achieve. Simply add your favorite liquid soap or body wash and scrub away. You can even use bar of soap by rubbing it against the surface until sufficient lather is built up. Whichever you choose, you will quickly have enough suds to get yourself clean, and the flexible fingers will do all of the work for you. Because they are soft, they bend and conform to the cleaning surface, but they are firm enough to deliver the scrubbing power necessary to clean and invigorate the dirtiest of body parts. You won't notice a rough feel like you may expect out of a bath scrubber, but you will notice how clean you skin is when you are done. Order Yours Today! 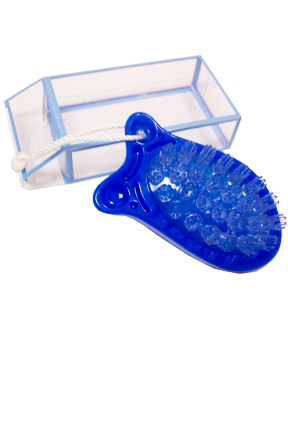 Body and Sole Bath Scrubber - Get yourself cleaner than ever using this amazing scrubber. It easily fits in your hand to give you unmatched body washing power. Order Yours Today! I need to know whether the little "fingers" are stiff. If I were to press it against my arm, would the little "fingers" collapse? Or would they hold up? I'm looking for a particular item for a particular purpose, thus the reason for the rather odd questions. Thanks! They are not stiff, and yes, they would collapse. Odd questions are always welcome here! I just purchased this item and really like it EXCEPT for the major problem it has no handle and its back is very slippery especially with soap--either I have to hold it with my fingernails chafing or choke up with the fingertips and stand back when the thing goes flying off. A handle or better formed back would have solved this...or has anyone else perfected a more practical technique? Otherwise it's a perfect hand-scrub-brush. Thanks for anyone's insight. A Microfiber Mat that is Super Soft, and Super Absorbent. Super Soft, Extremely Absorbent and Fast Drying. Spa Quality! Super Soft & Extra Absorbent. A Fast Drying, Spa Quality Towel. Sponge With Built In Soap For Cleaning, Exfoliating, Massaging, And Moisturizing. A Spongeables soap infused sponge for children. Fun SpongeBob Squarepants design. High quality, Paraben-free soap.